Spotify iPod: How to Download Music from Spotify to iPod Nano, iPod Shuffle, iPod Touch, etc. How to Download Spotify Music to iPod Nano, iPod Shuffle, iPod Touch, etc. 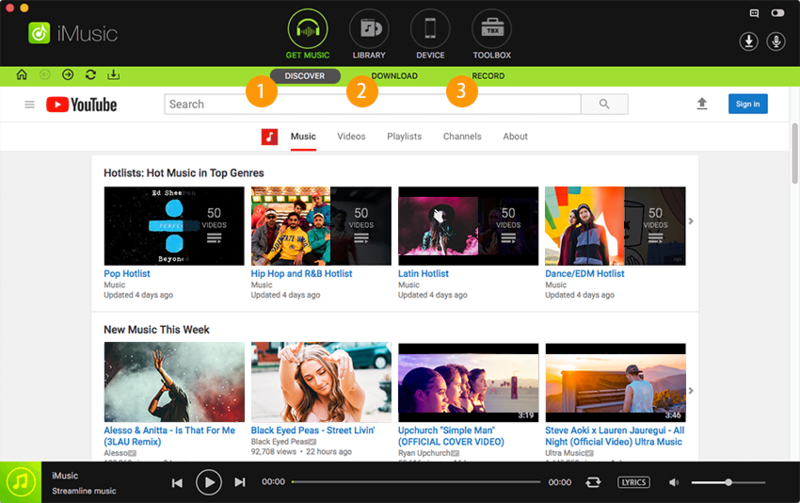 Spotify has become one of the most popular sources to listen music on iPhone, iPod Touch, iPad and even your computers. Although Spotify has provided amazing applications to listen music on different devices or users can use the web interface to listen music online, you can still transfer Spotify music to iPod for offline enjoyment. Here are the guides for how to download music from Spotify for free and transfer to iPod for enjoyment. iMusic is the best software to download and transfer Spotify music to iPod. 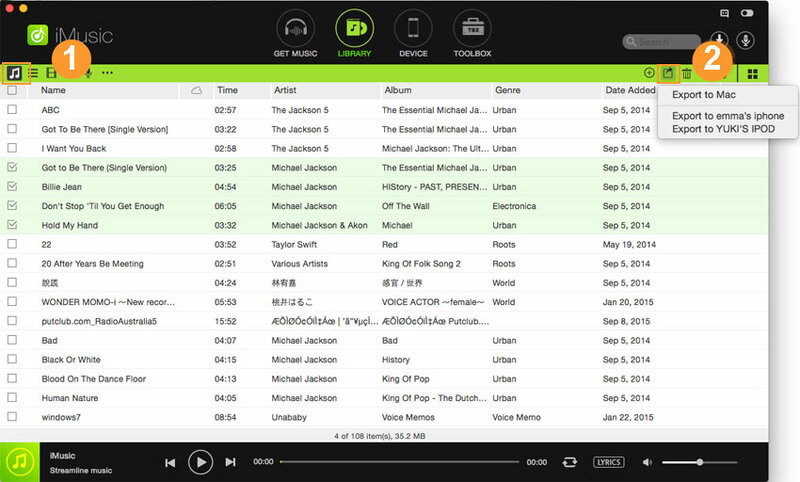 It is specially designed for music lovers to get music, manage music and share music freely. It is virus free software for Spotify download. Next, launch it. From the main window, you can see the main menus for the software. Please click "GET MUSIC". In the submenu, 3 options available: Discover, Download and Record. Step 2. There are 2 ways for you to download Spotify music to iPod. Option #1. Click "Discover". It is the music download resource for people. 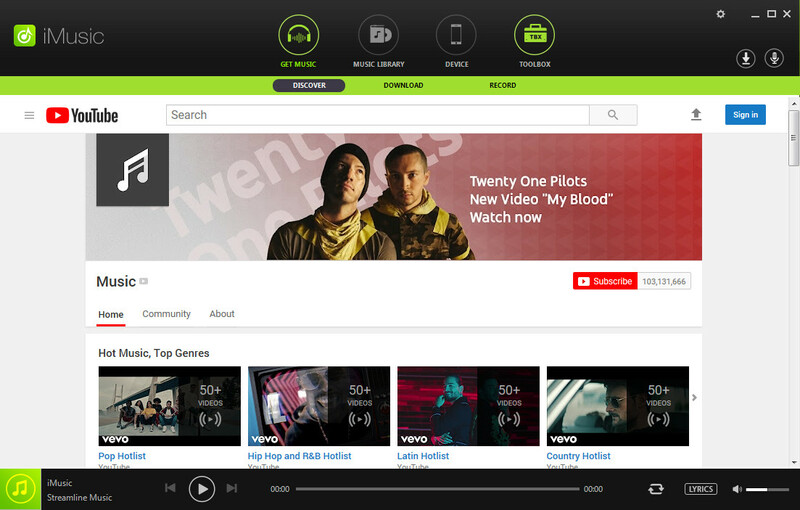 From there, you can see the hottest songs and top list from Spotify. Next, you can click the download icon beside a song to save the song to your computer. Option #2. Click "Download" to see the download window. 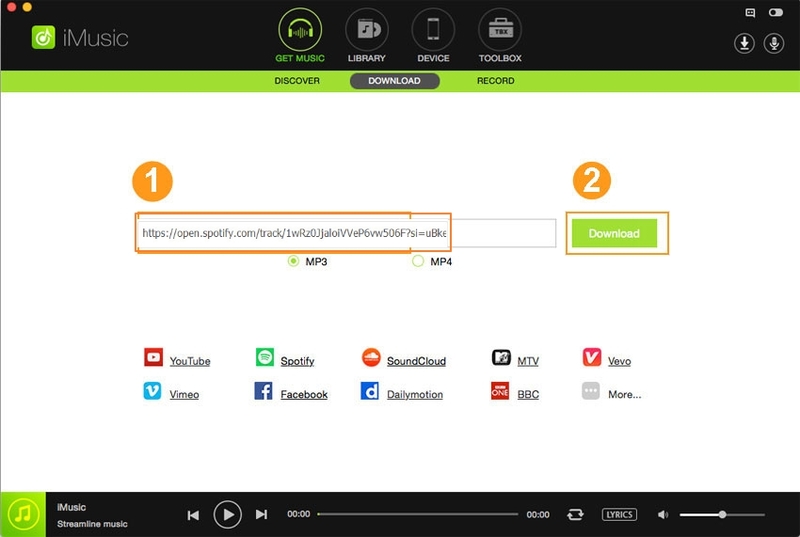 Next, open the Spotify song you want to download with your web browser. 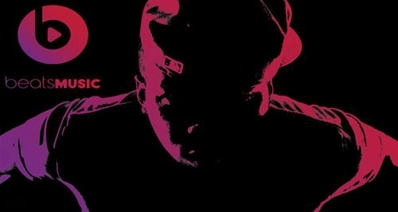 Copy the web address of the song and paste it to the download box in iMusic. Click "Download". All the downloaded Spotify songs are saved to the "LIBRARY". Connect your iPod with your computer via a USB cable. Next, click "LIBRARY" > find the downloaded songs. Select downloaded songs and click "Export" > "Export to iPod". This Spotify client will detect your iPod under the devices tab and you can select which music you want to transfer to these devices. This option is only available for the paid members of Spotify who have already downloaded the music content to listen them offline on their devices. If you are not a paid member, Spotify will not let you save the audio tracks and there is no option by which you can listen them on different devices. Here’s how you can sync the Spotify music to iPod via Spotify client on your computer. Step 1. First of all, download the Spotify client on your computer and install it either on Windows computer or Mac OS X (download Windows version and download Mac version). You can download it from the links given below and can follow the on screen instructions to install it on your computer. Spotify is a standalone software to transfer the music from your computer to your iPod, so, you will have to quit the other sync software such as iTunes to proceed. Step 2. Now, connect your iPod with the computer and launch the recently installed Spotify on your computer. It will detect your iPod and the iPod will be shown under the devices tab in Spotify. 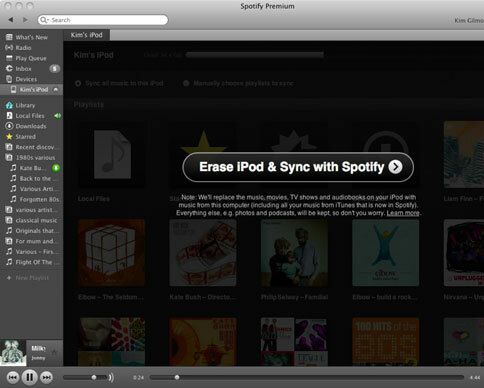 If you have never sync your iPod with Spotify before, it will ask you to erase all data present on your iPod and sync from the start. After removing all contents from your iPod, you can either select an option to transfer all music from Spotify to the iPod or can manually select the songs to transfer to your iPod. Select the appropriate option and the process of sync will be automatically started which may take some time depending upon the size of the data that you selected. Once the process of sync is finished, safely removed your iPod to finish the sync process. If you are a paid member and do not want to spend extra money to purchase individual song from the iTunes store, this is the best option that you can use to transfer all music. 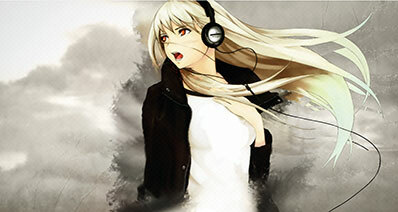 Moreover, it also provides a great option to listen all the music without deleting it from your computer. Spotify Client has more disadvantages as compared to the pros of the software. One of the biggest fault in using the software is that it will remove all the music content from your iPod. So, you can only sync either the music from iTunes or Spotify. Alternatively, all those users who have purchased content from iTunes and Spotify, will not be able to sync them both at the same time.